Scientists speculate that ours might not be the only universe out there — we might instead live in a set of infinite universes called a "multiverse". Infinite universes are a consequence of several scientific theories; for instance, if spacetime truly goes on forever it might start repeating eventually, since particles can only be arranged a finite number of ways. A multiverse could also arise from "bubble universes," pockets of space in an inflating universe that are never able to meet; or parallel universes, where multiple 3D universes are held in higher-dimensional space, unable to interact. 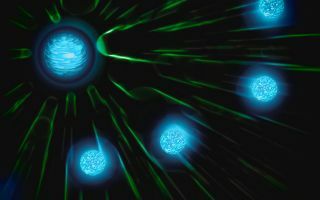 While some universes in a multiverse might be like our own, others could have wildly different laws of physics and fundamental constants. Before the Big Bang, time may have run in reverse. Is our universe sitting on the edge of an expanding bubble? What might stars be like in other universes? Some physicists claim the popular landscape of universes in string theory may not exist. A look at the space-themed works of experimental philosopher Jonathon Keats. Scientists speculate that ours might not be the only universe out there — we might instead live in a "multiverse". Could alien life be hiding in the multiverse? New studies say, "sure!" The great physicist's library of work is now complete. Stephen Hawking's last paper has been touted to provide a way to finally test for the existence of a multiverse, but it's unlikely to do that, several experts said. Stephen Hawking's final research paper could help astronomers find evidence that our universe is just one among many in a larger "multiverse," according to media reports. Physicist Stephen Hawking, whose death was announced March 14, wrote prodigiously for both a popular audience and the scientific community over the course of his career. Here are the highlights. Devoted fans don't need to wait till the end of the week to discover clues about what will happen when "Stranger Things" returns. What is the scientific basis for the popular science-fiction convention of multiple universes? The strange parallel universe on the show "Stranger Things" has some similarities to concepts physicists have proposed in the past.